Pennsylvania's former Democratic Attorney General Kathleen Kane was sentenced to 10 to 23 months in jail for perjury and obstruction of justice that was a part of a political retaliation feud. Kane, 50, had illegally disclosed details from a grand jury investigation to embarrass a rival and then lied about the incident under oath, local ABC affiliate WTAE reported. The former attorney general was also sentenced to eight years of probation by Montgomery County Judge Wendy Demchick-Alloy. "This case is about retaliation and revenge against perceived enemies who this defendant … felt had embarrassed her in the press," Demchick-Alloy said during the sentencing. Kane had been a rising political star in Pennsylvania after Bill and Hillary Clinton supporting her 2012 bid for attorney general, but Demchick-Alloymade said she never made the transition from politician to public servant. Kane was asked to resign back in August, when she was convicted of two felony counts of perjury and seven misdemeanor charges, by Pennsylvania's Democratic governor Tom Wolf, the Washington Free Beacon reported at the time. "I implore Attorney General Kane to do what is right: Put the commonwealth's residents first and step down," Wolf said. Kane apologized and made a tearful plea for leniency on Monday, the Morning Call reported. "I never meant for that to happen and I apologize to every Pennsylvanian who has felt disappointment, distrust, and disgust," Kane said. 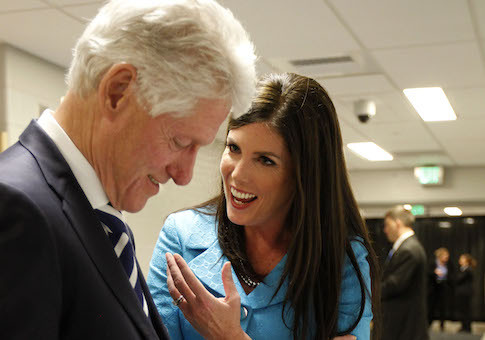 Prior to her criminal investigation, Kane received positive press coverage for vocally supporting gay marriage and was actively involved with the Penn State University sexual assault case after she criticized her predecessor’s handling of it. Turmoil arrived after Kane started feuding with the top deputies and career prosecutors in her office, the Associated Press reported. But turmoil inside the office became apparent as top deputies and career prosecutors headed for the doors. Kane’s feud with one of them, Frank Fina, who had helped run the Penn State probe and other sensitive investigations, led to the leak. Kane did not testify at the August trial. A jury convicted her on all nine counts. Common Pleas Judge Wendy Demchick-Alloy sharply warned Kane afterward that she would put her in jail if she tried to retaliate against anyone. The sentence could range from probation to a maximum 12 to 24 years in prison. This entry was posted in Politics and tagged Democratic Party, Pennsylvania. Bookmark the permalink.